The morning cup of tea, and then quite an elaborate breakfast, which soon led to a royal lunch, followed by more tea and snacks and then a lavish dinner either at a restaurant or relation or farm. This defines the indulgence we had in India during our recent visit. For someone like me who barely remembers the breakfast and lunches on salads and yogurt, this long trail got me starry eyed and dreamy – in the true sense, for the lunch soon led us to the bedroom for a long nap, something which I have not done for many years. We ate, we rested and had our fill. There was this urgency to try out everything that we miss here, at least once. The few weeks we had seemed like only a little bit of time. The home cooked food, the street foods, and also the restaurants and relatives to visit left us in a whirlwind. Once we got back, the extreme heat took us by surprise. The over indulgence in India and the intolerable heat here, kind of left us in no mood to eat. Fresh, light, juicy food is all we were craving for. This soup is something ma would make for me. A light healthy soup with a hint of tempering and I had liked it even cold unlike it is supposed to be had. But the way this soup is, it works all ways – steaming hot, or just warm. The soup is tempered very lightly with ghee, Curry leaves, mustard seeds and red pepper. It is not spicy; the whole red pepper and the fresh curry leaves with the ghee imparts a lovely subtle smoky flavor. And always use fresh tomatoes and fresh curry leaves for this soup. I loved this soup with some white rice stirred in it. Strange, I know, but it was good, especially when it was warm. During cooler times, some bread soaked in it would be fabulous too. Bring the water to a boil. Plunge the chopped tomatoes, sugar, salt and the grated coconut in the boiling water; cook for 2 minutes or until the water starts to boil again. Switch off the heat and cover. Leave it covered for 15 minutes. Uncover and use an immersion blender or pour it out in a food processor to blend the tomatoes and the coconut with the water to a smooth puree. If you wish, you can strain the puree to remove the bits of skin of the tomatoes. I do not care to strain anything out. Heat the ghee in a pan. Add the whole dry chili pepper; when the pepper turns dark brown, add the mustard seeds. When they start to pop, add the curry leaves, ( be careful and stay away, they will splatter due to the water content in the fresh leaves) and then the tomato, coconut puree. Lower the heat and simmer for about 2-5 minutes at medium heat. If you like it thicker, simmer for longer until you get the desired consistency. When ready to serve, swirl in the coconut milk/cream of coconut. Tomato, Coconut and a hint of butter. What else can one ask for!! Lovely clicks, Soma! Your soup looks perfect! Looks lovely my dear! 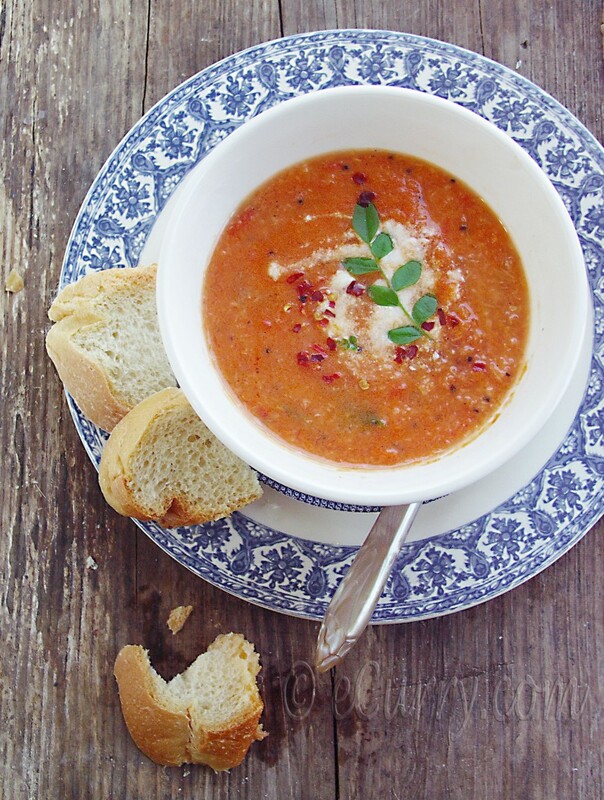 Great tomato soup recipes are ones to always hold dear :). I am freaking out, this looks so good! Love the addition of coconut in this soup. 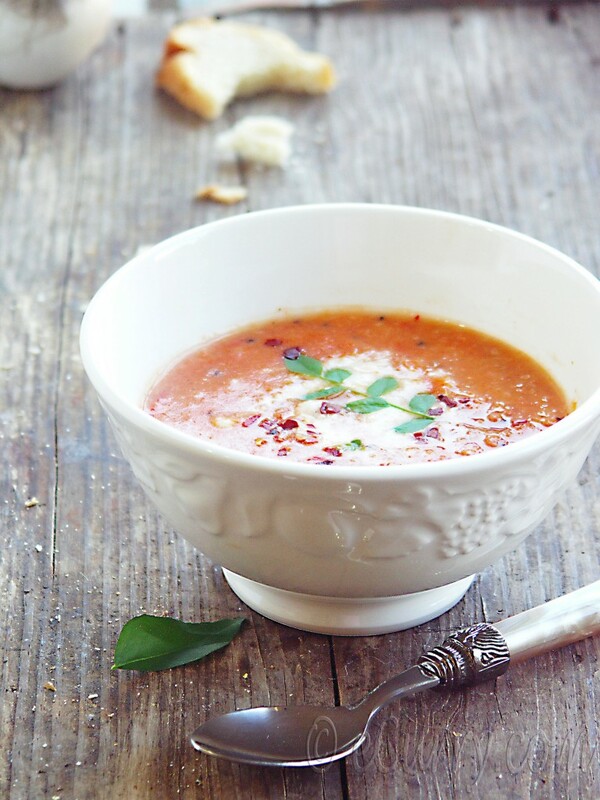 Makes it different (in a good way) from the tomato soups I’m accustomed to. Hi soma, This soup is looking superlite and just too perfect for me. loved the idea of tempering it with curry leaves and coconut milk. The color of the soup is inviting, lovely blend. thanks !!! A wonderful soup! What refined flavors. Tomato and coconut go so well together. Your soup looks fantastic Soma!! I’d never thought of combining tomato and coconut. It sounds really interesting and delicious. Hey Soma, What a lovely soup and your Ma’s too! Aww. your trip to India sounds wonderful. Beautiful pics the last one is my favorite:). Awesome combination. Tomato with coconut, tomato with bell pepper or tomato with anything – I am going to love it. Brilliant clicks. That looks so good Soma. I haven’t found fresh curry leaves here but am looking everywhere. I want to buy a whole bunch and then freeze them so I can use them “fresh” for future use. I love the photos! beautiful soup soma! I love the color and the flavours!! now thats a light refreshing soup with a hearty soul. I love love tomatoes and any form of food, with tomato as the soul, i am a sucker!!!! Love the tempering with ghee…Beautiful clicks! Oh! This looks so good! I could do with a bowl and it would go so well with the rains! Love the new look of eCurry, Soma! And that bowl of soup is a lovely mish mash of colorful and scrumptious in one. Great choice of angle in the first photograph! btw, had never thought of adding coconut/ coconut milk to a tomato soup, good idea to cut out the tang. Absolutely beautiful Soma, and I’m loving the new look you have going on here! Really clean + refreshing new header. 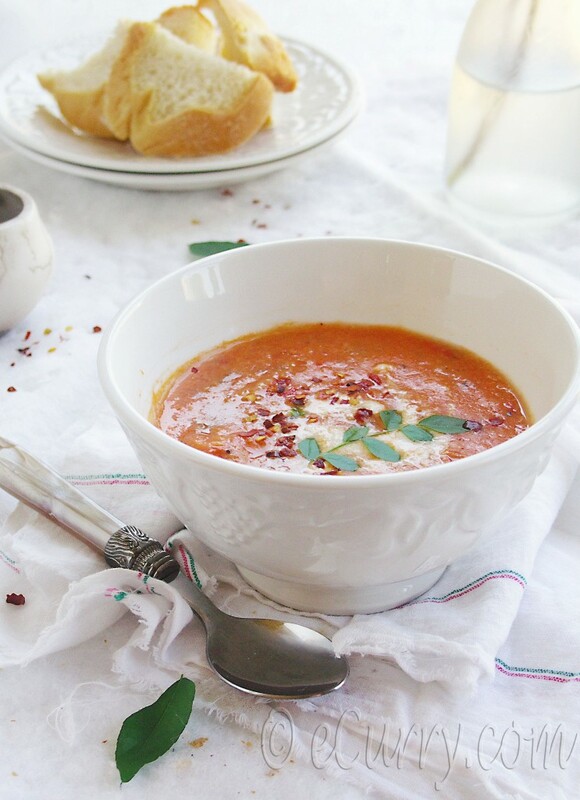 Now that it’s warming up I’m craving light soups in transition from the heartier ones from winter. This looks like the right fit. lovely shots Soma! 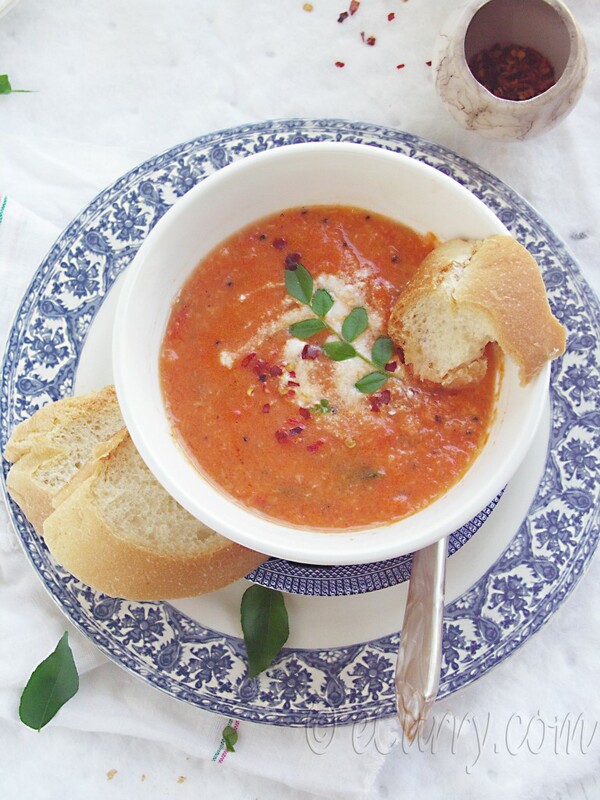 and i am loving this coconutty tomato soup! Tomato & coconut sounds great to me! Thanks for the recipe and photos. I just tried the soup out (found it several days back and kept on thinking of making it) and am enjoying eating it right now. 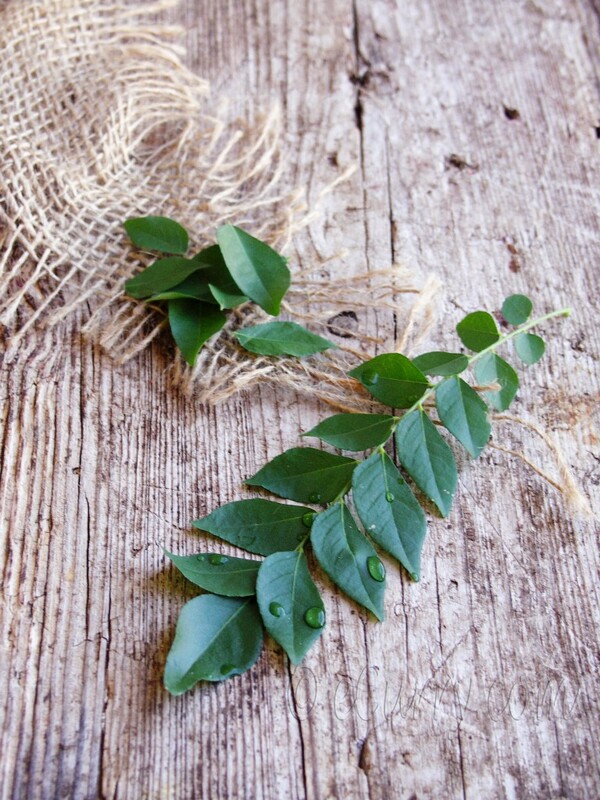 I didn’t have any fresh curry leaves, only dried, but those were also very nice. Also, I added a few teaspoons of tomato paste to deepen the tomato flavor a bit (I tasted it along the way and wanted a stronger tomato flavor – perhaps my tomatoes were a bit on the watery side) and that was a perfect addition. Cheers.